Most of the time since her diagnosis, Kate has been more sensitive to a number of things than she was in the past. For example, she was more easily frightened. I learned rather quickly to say, “Hello, I’m home.” as soon as I came in the house after being away. She has also been bothered by loud noises, especially sudden ones. Now that I have become more aware of the importance of her intuitive abilities, I am also paying more attention to her emotional responses to almost everything. As a result, I have noticed a significant change in her emotions as she loses more of her rational abilities. She expresses her emotions in a stronger way than she used to. Here are several examples. Since we eat out all the time, I notice this most often in restaurants. It’s not the general noise level. It’s the sudden noises that occur. The most typical example would be in a place like Panera where one of the employees comes around to pick up all the dirty dishes. He makes noise as he stacks them. The other night at Bonefish we were seated near the bar when the bartender knocked over a couple of glasses. Kate responded with a loud noise of her own. Several people at the surrounding tables took note. I told them she was all right. It could have been a time for one of my Alzheimer’s cards, but I didn’t think this situation called for that. Kate loves children, but sometimes they squeal or cry. She jumps and makes her own noise that is usually audible for those nearby. All of these things have been an issue for a long time. She is even more sensitive now, and her responses are more noticeable to others. She is frightened by other things as well. She is very cautious when we walk up and over curbs and across streets and parking lots. One of the restaurants we frequent has a flagstone walkway leading to the restaurant. She often takes my hand and comments about how “dangerous” it is. On several occasions in a restaurant, she has mentioned how dangerous a welcome mat is. I think the big issue is her eyesight. I think she has a problem with her depth perception and thinks the shapes and colors represent different heights rather than being flat or close to it. Other things generate more positive responses. Kate’s interest in children has increased lately. She almost always stops to say hello to the children she sees. A typical situation would be on our way in or out of a restaurant. In both cases, I usually lead the way. I look back frequently to make sure she is still with me. Often I see that she has stopped to talk with a child. She always tells the parents how adorable the child is. Like other things, this is not new except for the intensity of the emotion that she expresses. As large a role as music has played in our lives, Kate seems to get even more pleasure now. I notice this most when we are in the car. After leaving Casa Bella the other night, I played a CD of Beethoven’s Piano Concerto No. 5. The first movement ended as we got home. On the way to lunch the next day, I played the second movement. We hadn’t heard but a few notes, and she said, “Oh, that is so beautiful.” It is beautiful, but this immediate response is something I would never have expected before. I’m not even sure that she recognized the piece. Of course, I am learning that her memory for music is far greater than I had thought. I am amazed at her recognition of so many pieces of popular music, including some lyrics, from the 50s and 60s. I have alluded to her audible responses to music we hear at live performances like those at Casa Bella. The other night she reacted audibly to almost every song. She wasn’t loud. Only those sitting next to her or across from her could hear, but I keep wondering if this might become a problem in the future. 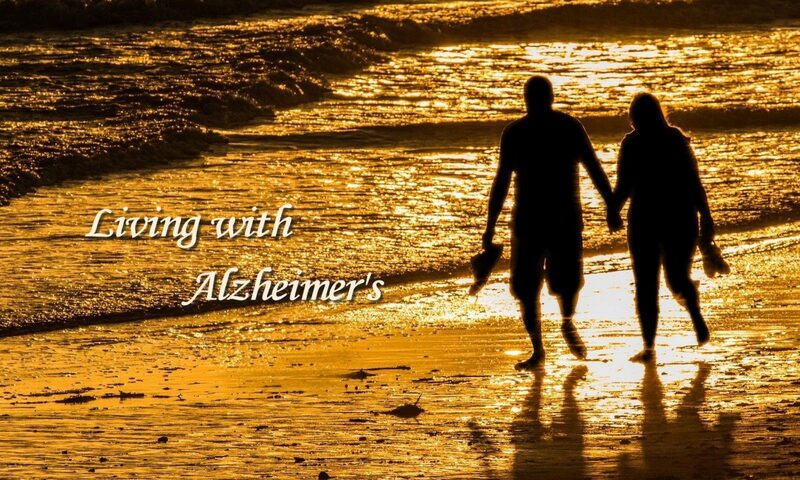 It’s not a problem at Casa Bella since all of the people with whom we sit are aware of her Alzheimer’s. It could be a problem elsewhere. Two other examples of her more intense emotional reactions occurred during the past week or two. One of those involved the fire at Notre Dame. The first time I mentioned it to her she had a strong reaction to the news. It looked as though tears were about to flow. Later she caught some of the TV news. By that time, she and I had talked about it several times. She never remembered from one time to the next. Each time, whether the source was the news or our conversation, she was quite moved. Another illustration involves her parents and occurred in two different situations. When she has asked about her parents, I have never tried to hide the fact that they died some time ago. On at least two occasions recently, she has been very sad when I told her. That has led me to be more careful. When she asks where her parents are, I usually say, “In Fort Worth.” There are other times I tell her “they are gone, but they lived long and happy lives.” So far that seems to work. When she talks about them as if they are alive, I don’t tell her otherwise. The other times she has an emotional reaction to them is when looking at one of her photo albums. In these cases, she is not sad because they are no longer alive. Her response is sign of her love for them. Sometimes she responds to me in a similar way when I tell her I love her. She gets a sad look on her face and tears well up in her eyes. Alzheimer’s has definitely made her more emotional in her reactions. The fortunate thing is that she has not exhibited the kinds of emotional reactions that people sometimes associate with dementia. She has had moments of irritability that are unlike her, but I haven’t seen the slightest indication of anger or violent behavior. On the contrary, she frequently apologizes after she has said something that is a more irritable response than is characteristic of her. Saturday night, we watched the last half of a PROMS concert in London. It was an entire program of music by Rodgers and Hammerstein. We have watched it before, but this time Kate was more engaged. That was evident by the fact that she put her iPad down to watch. She enjoyed it and everything seemed quite normal. When the program was over, Kate went to the bathroom to brush her teeth before coming to bed. When she came out, she saw me and looked puzzled. She said, “Where is he?” I said, “Who?” She said, “You know who.” I walked closer to her. She pointed in the direction of the family room and said, “Is he in there?” I said, “Who are you looking for?” She said, “Richard.” I said, “I’m Richard. I’m your husband.” She said, “No, you’re not.” I decided not to pursue it any further and gave her night gown to her. She didn’t ask any more questions. Just before midnight, Kate woke up. She moved over right next to me. She apparently had had a dream and was frightened. I said, “It’s all right. I am right here with you. Nothing’s going to happen.” She said, “What about my mother?” I told her she was safe, that I wouldn’t let anything happen to her either. She gradually relaxed. That began a conversation that lasted over an hour. She said, “I’m glad I have you.” I told her I felt the same way and that we had been together a long time. She wanted to know how long. I told her we had been married almost fifty-six years, and we had had a good marriage. She agreed. As we moved from our marriage to other questions about family, she asked, “What is your name?” She was loaded with other questions. She asked about our children, their names, where they lived, what they did. She also asked what kind of work she did. I told her about her teaching school, becoming a school librarian, and working as a volunteer church librarian for nineteen years. She said, “What’s my mother’s name?” I said, “Elizabeth Franklin. She was a special lady.” She picked up on “was” and said, “Is she gone?” Most of the time I answer honestly, but this time she really seemed worried. I said, “No, she is fine.” Then she said, “What’s my father’s name?” I said, “Carl Franklin. He’s a good man.” She said, “What’s his name again?” I told her. Then she said, “What’s my mother’s name?” I told her. She asked where they lived. After I told her, she wanted to know where we live. The last time I looked at the clock it was a couple of minutes after 1:00. Not long after that, we were both asleep. Just before 8:00 yesterday morning, she started to get up. I got to the bedroom as she was getting out of bed. She looked at me and gave me a big smile. Then she said, “I’m so glad to see you.” The way she said it, I could tell she thought I was someone else. I gave her a hug, and she hugged back. I asked if I could help her. She looked puzzled. I said, “I thought maybe you wanted to go to the bathroom.” She said, “I’d like some clothes first.” I said, “I’ll tell you what. I’ll get some clothes while you go to the bathroom.” I started to walk her to the bathroom when she said, “I look forward to being with you guys.” I walked her to the bathroom and left to get her clothes. When I came back, she appeared to know me. The rest of the day went well although there were other moments of confusion. For a while at lunch, she didn’t recognize me as her husband. I made reference to our children. She couldn’t believe we were married. I showed her a few pictures of Jesse and Kevin, and she changed her mind. I don’t know if she simply accepted that or if she really remembered. It was impossible to know for sure. I only know that she seemed more accepting. After lunch, I watched the Master’s with the sound off. I played music that I knew Kate enjoys. She lay down to rest but never went to sleep. She enjoyed the music. The biggest problem of the day occurred when we attended a drop-in at the home of a couple we have met at Casa Bella on jazz nights. They usually sit at our table, and I have enjoyed talking with them. Kate has not had the same connection. I accepted the invitation with the intention of putting in an appearance and then coming home. I hadn’t anticipated exactly how Kate would respond, but she has gotten along so well in other situations I decided to try. Big mistake. We were in a completely different part of town in a home in which we had never visited before. Along with that, there were a large number of people. It turned out that the primary connection was jazz. I saw several people I knew from other places in the community, but Kate didn’t know anyone. That included the people we really did know. The arrangement of the house was confusing to her. She didn’t know where she should go or what to do. A couple of times when I was engaged in a conversation, she walked away. She was quite uneasy and ready to leave almost from the time we arrived. There was nothing redeeming for her. I got something for us to eat, paid our respect to our hosts, and left. I have avoided social gatherings like this for quite some time. This experience confirmed what I suspected. It’s just too much for her. We relaxed when we got home. She sat down with her “Big Sister” album. I asked if she would like me to look through it with her. I was hoping (and expecting) she would say yes. She didn’t. After a while, I noticed she was as excited about the album as she usually is. That’s when I discovered that she was confused about what to do with it. She had been treating it like her iPad with the puzzles app. She kept touching the photos, but nothing happened. Even after I explained the problem, she couldn’t catch on. I suggested she take a break and work with her iPad. She was glad to do that and worked on it for the remainder of the evening. During the past couple of weeks, I have referred to how cheerful Kate has been. That hasn’t been true the past couple of days, especially yesterday. Like everything else, I can’t be sure exactly what accounts for the change; however, I always wonder if she isn’t feeling a bit discouraged about how she is doing. She is still sharp enough to recognize that she is not all right. Whatever the explanation, I know it is harder for me to be upbeat when she is not. Over the course of her Alzheimer’s Kate has experienced a variety of delusions. Most notably that has involved a belief that our home was her childhood home in Texas, a prior home in which we lived, or a B&B or hotel. Quite a few times she has also believed that we were going to have house guests when we weren’t. Around midnight yesterday, she had another delusion that is much less common. In fact, I think this may have been the first or second time she has had such an experience. She said something that woke me up. I asked if she was all right. She said, “What do I need to do?” I didn’t understand and said, “Right now you don’t need to do anything. You can relax and go back to sleep.” That didn’t satisfy her. She said, “What are we going to do about him?” I told her I didn’t know who she was talking about. She couldn’t remember “his” name, but said he was someone I used to work with. I started naming people I thought were most likely. I couldn’t get the right person. We finally gave up that line of questioning and focused on what she seemed to be concerned about. It took a lot of probing, but I learned that she thought someone who had worked with me was trying to get back at me by threatening to harm her. I suggested that it sounded like she may have had a dream. She insisted it was not a dream but acknowledged that it sounded like it could have been. I didn’t try to tell her otherwise. I shifted gears to comfort her without dealing with who the person was and what he was trying to do or whether it was a dream or a reality. I told her I would be with her and would protect her from any harm. I used that assurance to divert her attention by talking about us and our relationship. That offered us more to talk about than if I had focused solely on telling I would protect her. This didn’t have an immediate effect. She kept bringing up the man who was trying to get at me through her. I persisted, and gradually, over what seemed like an hour but was probably 30-40 minutes, she relaxed and went to sleep. By that time, she may have forgotten about “the man” altogether. Yesterday morning I had two surprises. I was happy about the first one. Not so for the second. First, the good news. I saw on the video cam that Kate was up, and it was about 8:00. I always like it when she gets up without my having to wake her. That is especially true on a day that we have a sitter. That insures that I don’t have to rush her before the sitter arrives. It’s even better on Monday because the sitter comes at noon instead of 1:00. When I got to the bedroom, she had just come out of the bathroom. She seemed alert and showed no signs of confusion. I asked if she was going to take a shower. She said she was. I knew that she would want to rest a while after her shower, but I also knew that we had plenty of time and still might be able to get to Panera for her muffin, something that is a rarity these days. As expected, she got her shower and went back to bed. A few minutes after 10:00 I decided to get her up. That’s when I received the second surprise of the morning. She wasn’t asleep, but her eyes were closed. I asked if she would like me to take her to get a muffin. She gave me a strange look. She wasn’t the same alert Kate I had greeted earlier. She was clearly confused. When I said that I had her clothes out and would help her get dressed, she looked at me sternly and said, “Who are you?” I gave her my name and told her I was her husband. She was surprised. That is not unusual; however, she was obviously uncomfortable and pulled the covers up to her neck. I said, “You do recognize me, don’t you?” She didn’t and didn’t want me to help her dress. This was totally unlike any of our previous experiences. There wasn’t any way that I was going to explain this. I didn’t push her. I told her I thought I could help her and got her “Big Sister” album. I showed her the photo of her and her brother on the cover. She didn’t show any sign of recognition until I pointed to her picture and said, “Who do you think this little girl is?” She hesitated and then said, “Me.” I turned to the first page and showed her a photo of her with her mother and daddy. Then I turned to a section that has a few of our wedding pictures. She didn’t remember anything. I decided she just needed a little more time. I told her I wanted to take her to get a muffin. She asked about her clothes. I showed them to her and suggested she get dressed. By this time, she was beginning to feel more comfortable with me, but she still did not believe I was her husband. She did, however, let me help her dress. When she was dressed, she noticed a wedding picture of our daughter, Jesse, on the dresser and said, “Who is she?” I explained that she was our daughter. She walked over to it and asked if she could take it with us. I told her she could. She asked where she could keep it. I told her this was our room and that she could keep it right there on the dresser if she liked. She still wanted to take it with her. In the car on the way to Panera, I said, “You seem like you’re feeling less confused now.” She acknowledged that she was and said, “What’s your name?” I said, “Richard Lee Creighton.” Then she asked me her name. I said, “Katherine Franklin Creighton.” She frowned when she heard “Creighton.” I didn’t say anything. When we got closer to Panera, she asked my name again. I told her and added that I was her husband. She wasn’t buying that. After we had been seated a while, she asked my name. I told her and said that I was her husband. She didn’t believe me. Again, I didn’t push. We had been at Panera about forty minutes when I thought we needed to get home for the sitter. On the way I reached out my hand and touched her leg and said, “I love you.” She put her fingers to her lips and blew me a kiss and said, “I love you too.” I took that as a sign that she had finally recognized who I was. The sitter arrived a few minutes after we were home, and Kate seemed perfectly normal. I said I was going to Rotary, and she said, “What are we going to do?” I told her that she and Cindy could go to lunch at either Applebee’s or Panera. She said, “Why don’t you go with us?” I explained that I needed to attend my meeting. She didn’t seem to mind that, but I was glad to see that she would have felt even better if I had stayed. When I returned home, I was pleasantly surprised to see that Kate and Cindy were having a conversation in the family room. Kate seemed to be taking the lead. Cindy said they had gone to Applebee’s for lunch and come back to the house. She said Kate had not worked on her iPad at all and that they had been talking the whole time. That was another surprise and a welcome one. I was happy for two reasons. First, that she hadn’t had a nap. Second, because she was able to engage in conversation for such a long period of time and that she was doing a lot of the talking. I want Kate to develop a strong relationship with her. This was a dramatic contrast with her confusion this morning. I felt much better. The rest of the day went very well. We spent about an hour and a half at Barnes & Noble and then went out for a Mexican meal at Chalupas. She spent the rest of the evening working on her iPad while I watched the news. Then I turned on a series of YouTube videos for her. Several times she needed help with her puzzles, but she seemed to get along well after that. When I told her it was bedtime, she was very cooperative. She slept through the night and is still sleeping as I finish this post at 7:30. The closest thing to a hallucination Kate has experienced is deja vu. For years this was a very common experience. Over the past year or so it has almost disappeared. This happened most commonly in restaurants. She often pointed to other customers and would say something like “See that couple over there. They always sit in that same place.” That might have been so in a restaurant we frequented on a regular basis, but she had these experiences in places where we had never been before. It also happened in hotels where we hadn’t stayed before. Although rare, she has also had experiences that I would definitely call delusions. These have usually been a belief that someone was coming to our house for a visit or that we were leaving the house on a trip. On arriving or leaving our home, she has often thought our house was a hotel, a B&B, or a former home in Texas. When she got up a few weeks ago, she appeared anxious and asked me if she had to to go to a meeting. I told her she didn’t have any obligations that morning, and she was greatly relieved. That was all there was to it. Something happened yesterday that was quite different. When I got home to relieve the sitter, I walked into the family room. As I did, Mary told Kate she would see her next week. Kate looked frightened and said, “You’re not coming back?” Mary repeated that she would be back next week. Kate said, “Good, because I need you.” I was surprised at the emotion she expressed. She may have thought Mary was leaving her alone right then. That didn’t end the emotions she was feeling. She continued to say she thought she had done “something awful.” It went on for at least thirty minutes until after we were seated for pizza at our nearby pizza place. I was surprised that her memory allowed her to remember for so long, but feelings last much longer. As she talked, I tried to concentrate on comforting her and didn’t push her to explain. Normally, she can’t explain the way she feels and doesn’t want to try. Not this time. She wanted to explain what she was feeling. She said she didn’t know what it was, but it was terrible. After we were seated at the restaurant, she gradually began to calm down. Several times I said, “You seem more relaxed now.” She said, “I’m getting there.” I said, “It takes time when you’ve had an experience like this.” She agreed. Before our pizza arrived, it was over. I’m glad we escaped anything more serious than this but wonder what else we may encounter in the days ahead. Yesterday a nurse contracted with our long-term care insurance company came by the house for a periodic check up on Kate’s condition. I spoke with her in advance to let her know that Kate no longer remembers that she has Alzheimer’s and that I don’t want to remind her. She was mindful of that, but the test itself was a struggle. There seems to be no way around some of the things that are required of the people who check on the insurance company’s clients. When the nurse came in, the first thing she did was show us her photo ID. She explained that she was there in connection with the in-home care Kate is receiving and mentioned the name of the company that provides our sitter. I don’t believe Kate has understood that she has in-home care from an agency. I have only told her that the sitter is someone I have asked to stay with her while I am gone. Kate accepts that because she doesn’t want to be left alone; however, I don’t believe she thinks of herself as having a caregiver. I know she recognizes that I do just about everything for her, but I don’t think she sees me as a caregiver or that she needs one. At this stage, I suppose none of this matters since Kate doesn’t remember that the nurse came by at all, much less what she said or asked. Nonetheless, I felt uncomfortable for Kate throughout the thirty-five-minute interview. By far the worst part was observing her miserable performance on the “test.” The nurse handled it well by explaining that there are no right or wrong answers. She was very encouraging when Kate struggled for her answers. Several times she said, “This is ridiculous.” I should add that she also said “Thank you. I appreciate your understanding.” when Kate tried very hard to remember something and couldn’t. By this time, Kate has had quite a few such tests. I suspect I am not the only spouse or child to feel uncomfortable watching his loved one go through this process. Although I am concerned about the next one, I suspect that she is now reaching a point when it may not frustrate her. I know this has to be done, but it runs counter to the way I try to relate to her.